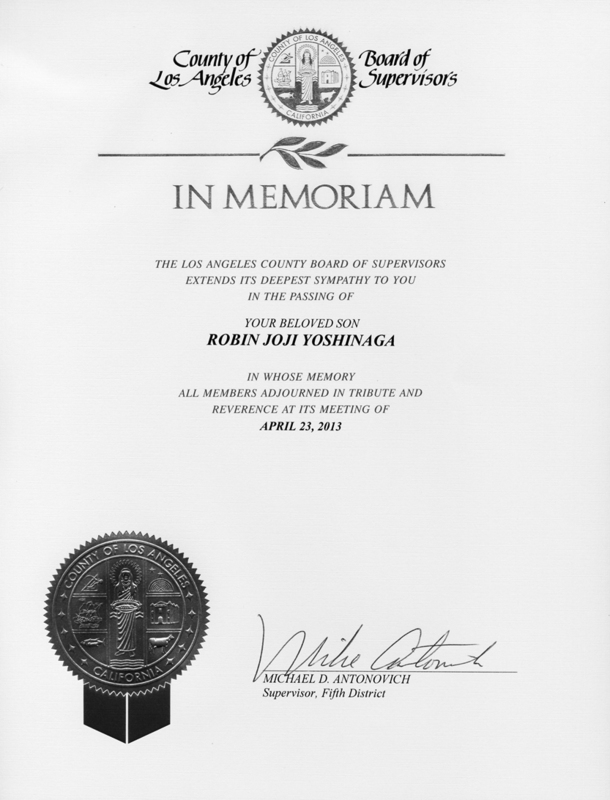 I want to open today’s column by expressing my deepest appreciation to Supervisor Mike Antonovich for getting the Los Angeles County Board of Supervisors to issue a memoriam in honor of my recently deceased son Robin. It is greatly appreciated by my wife and me and our other three sons, Paul, Mark and Tim. Thank you, Mike and the rest of the board, for your thoughtfulness and kindness. Today is Wednesday and about 8 a.m. our phone rang. Usually, I don’t answer calls in the early a.m., but decided I had to get out of bed anyway, so I answered the call. “Hey Horse, did I get you up?” said the voice on the other end of the line. “I guess since you’re still in bed so you didn’t see today’s L.A. Times,” he said. He was right. I hadn’t seen the newspaper, which was probably still in our driveway. So, I threw my pajamas off, put on my clothes and walked out to pick up The Times. It’s a story on Undersheriff Paul Tanaka’s ongoing battle with his boss, Sheriff Lee Baca, who recently discharged the Sansei as his undersheriff because of the controversy over the jailhouse abuse issue. Of course, I am always curious about articles appearing in The Times because the newspaper often slants stories to fill its philosophical intents. In the case of this story, there doesn’t appear to be too much “slanting” favoring one side over the other. Tanaka seemed to have been given his right to express his opinion on the issues in his battle with the Baca. The article even pointed out that Tanaka may run against Baca when he seeks re-election in 2014. I guess for Japanese Americans who have a working knowledge of the Japanese language, we get a kick out of the sheriff’s name. In fact, when the sheriff visited Japan a few years ago, I kind of made a joke out of his being introduced to the media over there. We all know the definition of baka, don’t we? By the way, one of the issues presented by Tanaka involved the many foreign trips Baca has taken during his years as the head man of the L.A. County Sheriff’s Department. “What was the reason for him to spend taxpayer money to travel to foreign countries?” was the way Tanaka put it. Seems like nobody ever posed this question. I certainly am curious why he toured Japan. Maybe the trip did make Baca look like a baka. Oh well, it will be interesting to see how the battle between the two shapes up. 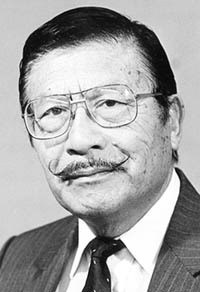 Let’s not forget Tanaka is still the mayor of Gardena and he was re-elected to a third term, meaning a lot of people feel he has the know-how to get things done. Hey, the City of Gardena is in better shape now than ever before. Here’s a piece of writing that for one reason or another I buried under a stack of other papers and didn’t get a chance to print in my column. So it might be a little dated, but still worth printing. “On Friday, April 5, a small group consisting of three veterans, one wife, and the color guard with their sergeant instructor from Lincoln High School gathered in Evergreen Cemetery to honor the memory of Sadao Munemori, who died on this date in 1945, saving the lives of his comrades in far-off Seravezza, Italy. “He was awarded the first Medal of Honor to a Japanese American, posthumously, on March 7, 1946. “I had forgotten the date myself, but the ROTC Color Guard and their instructor did not. “Sadao was one of the many Nisei GIs, remembered only by their families, who fought and gave their lives in WWII, so that we could have the life we have today. “Now it is our turn to serve others, even if we didn’t fight in WWII, by helping the ROTC students at Lincoln High School, which is in the poorer neighborhood, learn discipline and good scholarly habits so they could succeed in life. “One graduate is in college and aiming for law school while others pursue other fields such as nursing. I hope they get the support they are seeking. Thanks, Teruo. Our true war heroes should not be forgotten as time passes. The photo was taken quite a while back when the Japan Baseball League named Wally Yonamine to its Hall of Fame and held the induction ceremony in Honolulu. 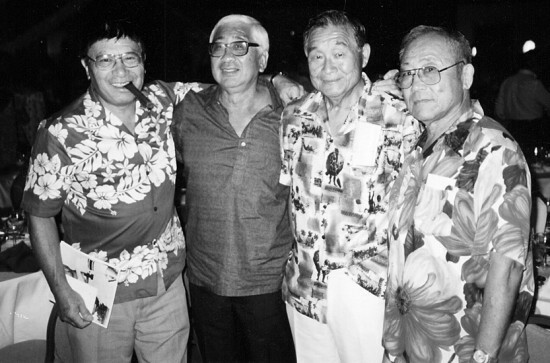 A few of us who were close friends of Wally jumped on a plane to attend the banquet in Hawaii. In the photo are (left to right): Guess who, Babe Nomura, Yoneo Narumi and the late Jake Kakuuchi. Check out our fancy aloha shirts, which made us feel like we belonged in Hawaii, not a bunch of kotonks. Yes, that’s a cigar sticking out of my mouth. Thanks for the photo, Rosie. It sure rekindled a lot of fond memories. Okay, for those of you who don’t know what a kotonk is, it’s the name the Islanders tagged on mainland Nisei. At first it was considered an insulting tag, but as it continued to be used to describe the mainland Nisei, it almost became a natural nickname. Especially if the falling coconut was empty. • Aspire to inspire before you expire. • My wife and I had words, but I didn’t get to use mine. • Frustration is trying to find your glasses without your glasses. • Blessed are those who give without remembering and take without forgetting. • The irony of life is that by the time you’re old enough to know your way around, you’re not going anywhere. • God made man before woman so as to give him time to think of an answer for her first question. • I was always taught to respect my elders, but it keeps getting harder and harder to find one. Wait a minute. I have a few more inches to fill. The City of Gardena is playing with the idea of banning smoking in public places. I guess I might not be able to light my cigar, which I don’t do anyway. However, this might be good news for cigarette importers in Japan, which now imports 91% of U.S.-made cigarettes. According to USA Today, U.S. cigarette exports peaked at 244 billion in 1996 and fell to 19 billion in 2012. Maybe smoking bans will reduce demand in the U.S. and increase exports.